On Flag Day June 14, 2012, Retired Marine Captain Guy Field Rowe completed his earthly service to his country, his family, and his God, which had begun 87 years earlier when he was born on November 10, the observed birthday of the United States Marine Corps. Throughout his entire life, Guy Rowe was both a gentleman and a gentle man. , continuing to serve his country for 22 years. In November of 2011, after being diagnosed with Stage IV cancer, Captain Rowe was the MWSS 471 guest of honor at the 236th Marine Corps Birthday Ball and, this spring, was an enthusiastic participant in an Honor Flight to Washington, D.C. to visit the memorials which recognize the sacrifices made in service to our country. ed to live a full life, including a wonderful celebration of their 50th Wedding Anniversary just prior to her death in 2008. Guy's steadfast faith resulted in his earthly service to his God through the Boy Scouts of America, his church, and his community, as evidenced by his many activities. In recent years, he taught AARP driving classes and made presentations to school and community groups about Iwo Jima. Guy was known and admired for his strength, both physical and mental. His love of music, poetry, math, science, dancing, and traveling was eclipsed only by his love for his wife and children. In his service to his family, country, and God, Guy Rowe epitomized the motto of the United States Marine Corps "Semper Fidelis" (Always Faithful). "Semper Fi" signifies the unrelenting dedication and loyalty that individual Marines have for "Corps and Country", even after leaving service. 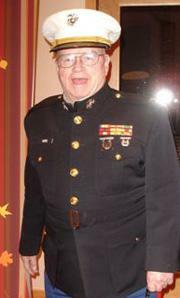 So lived Guy Rowe: son, Marine, husband, father, church member, community servant. Captain Rowe was preceded in death by his wife, Evelyn; parents, George M. and Harriet Koller Rowe; brother, Herbert; and sister, Ruth. He is survived by his children, George and Harriet of Otsego; his sister, Beverly Loomis of Shrewsbury, MA: and many nieces, nephews, great-nieces and great-nephews. A memorial service will be held at 1:00 P.M., June 23, 2012, Community United Methodist Church, Monticello. MN. With Rev. Rhodel Jacobson officiating. A family graveside service will be held on June 22, 2012 at 1:00 at Roselawn Cemetery in St. Paul where Guy will join his wife. Memorial contributions may be made to the Boy Scouts of America, the St. Cloud Honor Flight, or a service organization of your choice.